Balthasar van der Ast, who specialised in flower paintings, trained with his brother-in-law Ambrosius Bosschaert. 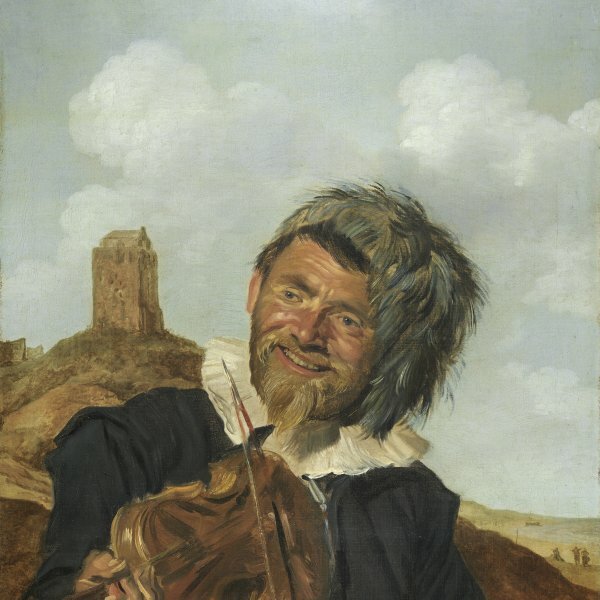 His compositions are based and inspired on those of Bosschaert although his use of line and brushstroke is softer. The parallels between his output and those of the Bosschaer family has at times resulted in his work being associated with their output. Van der Ast produced a large body of work that is difficult to date as he only dated his paintings in the 1620s. The present panel is signed and dated 1628 at the lower right corner. The organisation of the composition and its elements is comparable to the work of Ambrosius Bosschaert with a plain, smooth ledge emerging from the background on which rests a vase filled with brightly coloured flowers with an emphasis on red, yellow, orange, pink and white tones. The bouquet is organized around a central axis marked by the single blue flower in the form of an iris that marks the top of the arrangement. A carefully chosen range of flowers shown at their peak of perfection create the bouquet in which roses with velvety petals frame the lower edge of the vase. The middle and background planes are used for the stalks and leaves of this splendid bouquet. The vase is oriental with a gilt-metal foot and is very similar to the one to be seen in the composition by Bosschaert also in this Collection. 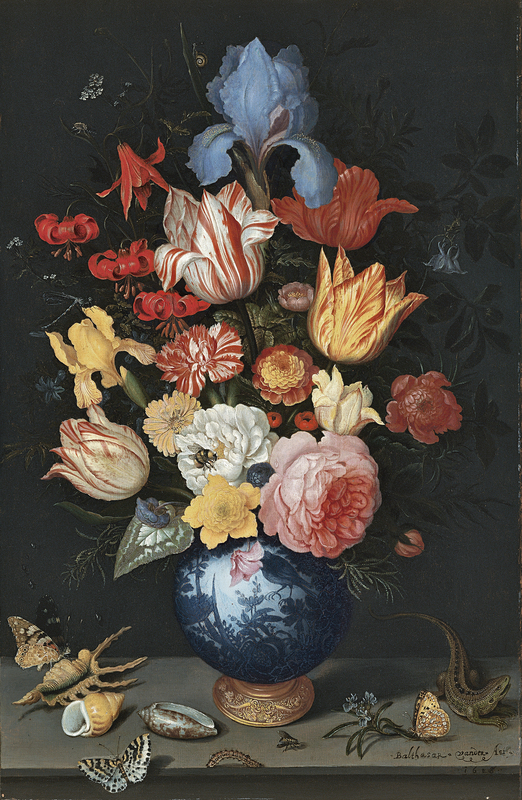 Despite the similarity of the vases, Sam Segal noted that Van der Ast preferred motifs of birds and grasshoppers while Bosschaert decorated his vases with flowers. The present still life includes elements highly typical of Van der Ast’s style, including the presence of shells, insects and the decorative lizard located just above his signature, its body arranged in a sinuous, twisting position. Shells were particularly widely used by the artist and their depiction (like that of the different flowers selected for his bouquets) should be related to the phenomenon of collecting curiosities that was widespread in Holland at this date. As in other still lifes by the artist, the present example includes butterflies that perch on the ledge or on the leaves, as well as insects and caterpillars. Their presence has been interpreted in a moralizing sense but in general art historians have tended to emphasise the artist’s careful selection of his motifs rather than any underlying meaning in these still lifes.